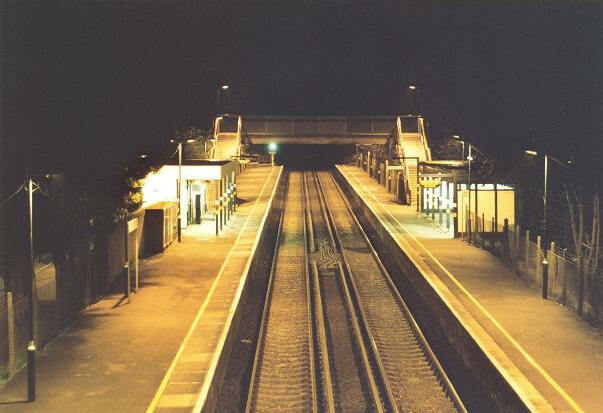 This was once a unique station within the confines of the LC&DR network, but its lack of conformity sadly saw it obliterated by British Rail's ''modernisation'' policy. The unusual architecture was a result of the station opening some 11½ years later than its counterparts, on 12th June 1872. From the outset it was intended for the station to serve the small village of Longfield, but paradoxically, it was named ''Fawkham'', accompanied with the suffix ''for Hartley & Longfield''. The Fawkham name had been instated on the name boards at the request of the owner of Fawkham Manor, which was situated (with its associated village) about one mile away. This was despite the fact that station was actually located within Longfield! 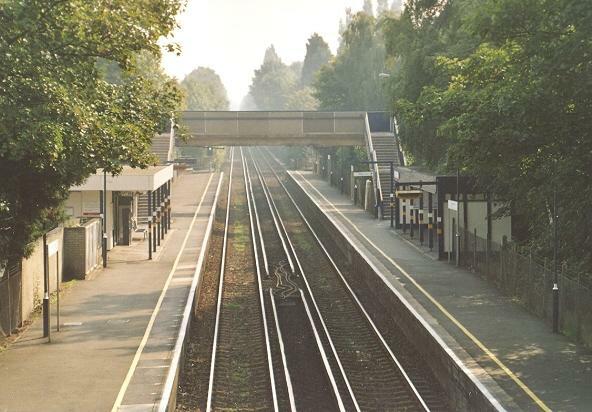 Two platform faces were provided here, but despite being a later addition to the route, still no footbridge was in evidence, a track foot crossing instead being utilised. The main building here was situated on the ''down'' side, this being the source of the station's architectural interest: single-storey, it was, however, built in brick and sported a distinctive canopy of two pitched sections - almost identical to the elaborate examples once in evidence on the Eastern Region, at Seven Sisters. The ''up'' side was host to the usual ''secondary'' waiting facilities, comprising of a single timber shelter, but even this had an ornate valance. A signal box of Saxby & Farmer design appeared at the London end of the ''down'' platform during the 1880s. Another consequence of not opening with the line was that the site did not have a goods shed, a feature which was very common along the route. Two sidings were, however, provided for freight traffic, these being situated on the ''down'' side, to the west of the platforms; coal was the main commodity handled here. An additional rolling stock siding of considerable length was also a feature on the ''up'' side, trailing off in the eastward direction and terminating behind the platform. Around 1900 there was the possibility of the station being re-sited about 1200 yards to the west of the existing platforms, but this later did not transpire. Electric running between Victoria and Gillingham was made possible on 2nd July 1939 and in conjunction with this, a metal footbridge was provided at the western ends of the platforms. Of course, steam-hauled services still stopped here to take passengers beyond the Medway towns and onto the Kent Coast. The June 1959 Kent Coast Electrification saw the platforms lengthened at their London ends with concrete extensions and the footbridge extended at its southern end to provide access to a public footpath. That was followed in June 1961 by the renaming of the station to ''Longfield'' and the removal of the suffix, and then eleven months later by the withdrawal of goods facilities and decommissioning of all sidings. Both Meopham and Longfield signal cabins went out of use in November 1965 when their functions were assumed by the 1959-installed signalling panel at Rochester. However, the largest alteration came in 1971 with the total demolition of the historic station, it being replaced with the dreaded CLASP modular system of the period. This also included the removal of the ''up'' platform staircase of the original footbridge to allow it to become dedicated to the public, and the provision of a CLASP-inspired station bridge at the eastern end of the new structures. Class 375 No. 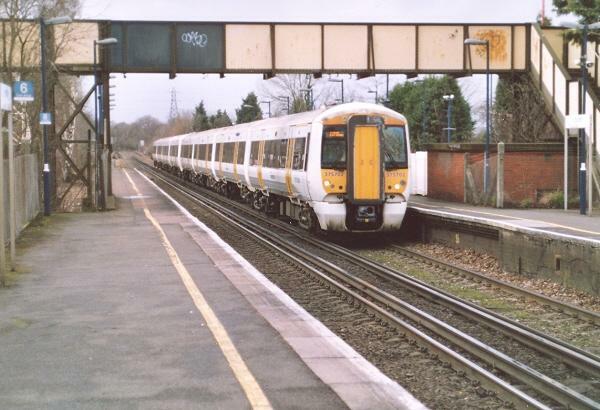 375702 breezes through the station with a Kent Coast service on 9th March 2006.